Measurement Rentals offers the Agilent N9342C handheld spectrum analysers for hire. A high performance handheld spectrum analyser (HSA), the Agilent N9342C delivers accurate spectrum analysis and field strength measurements. Agilent N9342C handheld spectrum analysers cover 100 kHz to 7 GHz with preamplifier and spectrogram spectrum recording, site survey (drive test) scan mode with GPS, filter sweep and diplexer tune-up, and Cable & Antenna Test (CAT) with internal directional bridge. Featuring a colour daylight-viewable display, the Agilent HSA stores screen/trace results onto a USB memory stick. The battery-operated device offers four hours of continuous operation and can be recharged on the fly. 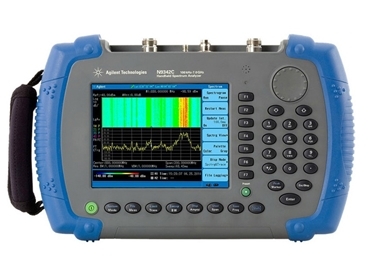 Especially suited to RF interference, site surveys, drive test and similar measurement applications, Agilent N9342C handheld spectrum analysers feature a built-in GPS receiver and internal antenna, and in-built RF spectrum data logging. The HSA is ideal for mobile operation as no PC is required for data logging. Return loss to 7 GHz (with built-in directional bridge) for antenna sweep etc.